Light Space & Time Online Art Gallery announces a Juried Art Competition for the month of November with the theme “Countryside”. A Group exhibition of the top ten finalists will be held online at the Light Space & Time Art Gallery for the month of December 2011. 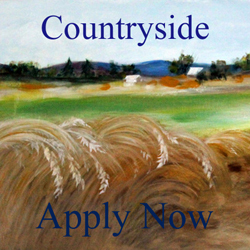 The theme is the Countryside and the gallery wants all 2D artists to send us your best interpretation of the theme “Countryside" by depicting rural living, the outdoors and pastoral scenes. Light Space & Time encourages entries from all 2D artists regardless of where they reside and regardless of their experience or education in the art field. A group exhibition of the top five finalists and in addition, Honorable Mention and Special Recognition awards will also be made awarded. The group exhibition will be held online at the Light Space & Time Online Art Gallery during the month of December 2011. The submission process and the deadline is November 28, 2011.